Last night I uploaded two photos at the same time. As of this posting one had 96 views on Flickr and the other had 1,389 views. The photo with 96 views used a fisheye lens that cost 4x more than the other photo. (Thank you to Pro Photo Rental for coming along on the Las Vegas Blog World Expo photo walk and bringing $40,000 worth of equipment for all of us to try!) Shows that exotic equipment isn’t guaranteed to bring in views. The photo with 96 views required better camera technique to make than the other photo. The photo with 96 views is of a far more recognizable landmark than the other photo (the Bellagio in Las Vegas). Yet one photo has gotten more than 13x more views. 1. Promotion. I Twittered the photo that got a lot of views and kept the conversation going on both Twitter and on FriendFeed throughout the evening. Also, my first Tweet about this photo was designed to get all six of these items communicated to my audience. 2. The subject. The photo with all the hits is Hugh Macleod, famous blogging artist who did the art on the SXSW bags and the TechCrunch party posters and, among bloggers and other influentials, is very popular (about 20% of all business cards I have from well-known bloggers, including my own, were done by Hugh). 3. Scarcity. There are thousands of cool photos of the Bellagio. 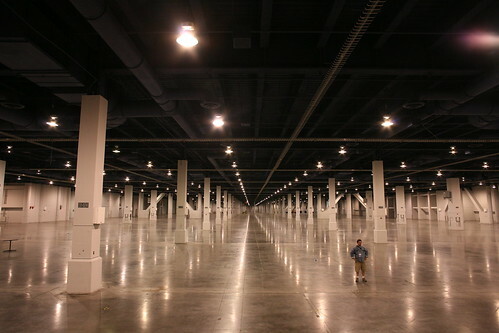 But how many photos of the Las Vegas Convention Hall of it empty with one person standing in it have you seen? 4. Socialness. People “favorited” the photo of Hugh 17 times while the other one was only favorited twice. Each time someone clicks “Favorite” on a photo, it is sent to their audiences. Plus, if you’ve registered Flickr on FriendFeed it will get reshared there. Also, many people retweeted my Twitter message and sent it to their friends. 5. Humor. Hugh’s blog is called “gapingvoid.” The fact that I got him to stand inside a gaping void long enough to make a photo of him is funny. 6. Serendipitous. The photo with 96 visits was prepared for. We were on a planned photo walk. We all had our cameras, expensive equipment ready, and were looking for photos. The one of Hugh? Totally unplanned. A friend had to pick something up at a Kinkos down there, I saw this opportunity, pulled my camera out of my bag, and took 20 seconds making the image. If I hadn’t carried my camera everywhere I would never have gotten the more viewed shot. All of these demonstrate how to succeed in the media business. The same formula works with blog posts, videos, or photos. Oh, one other thing. The Web actually works against the photo of Hugh. It’s hard to see him on the average laptop monitor. This works a lot better as a 16×20-inch or larger print (I’m going to make one for Hugh, cause he’s brought me so much joy). Other things I’ve learned from the photos I uploaded last night? Laughing baby photos pull 3x more than regular baby photos. Also, photos with women in them outpull photos with men in them. Keep in mind that I haven’t applied ANY of Thomas Hawk’s lessons (he does a lot of post-processing, er, Photoshop manipulation to make his photos more “social.”) Watch his photo blog and see just how much more interesting his images are than mine. That’s cause none of mine have any post-processing done to them yet. Anyway, just some fun on a Sunday afternoon. Here’s the two original photos. Next Post Anti-depression thinking: what do we do? eva: no, I tweeted it, which automatically puts it into FriendFeed. Other people retwetted it or favorited it. But, yes, you probably saw mention of it a few times (including here). Very cool analysis Robert. People always wonder how to get out there and get something noticed. I would have never thought of some of the points you made above as to how this became more viewed than the other. Maybe next time, you could have a woman in the pic and it would be viewed all the more! What’s surprising? One’s good and received lots of views. One’s not very interesting and only received a few views. What would have been more interesting is if you’d reversed it and talked up the Bellagio photo. Clearly broadcasting your photo through social media is going to help boost the numbers. Aside from the content or gear of the photo, Flickr is designed for you to broadcast your last 1 or 5 uploaded photos to your contacts. Your Flickr contacts can specify with in their “From Your Contacts” page whether they want to view 1 or 5 photos from each person in their contacts. Regardless of your contacts settings it is almost always the last uploaded image that gets the attention of your contacts. Something to consider when uploading images if you’re aiming for bigger numbers. To be honest as to what grabs the attention of your viewers organically is skewed based on how the image pops as a thumbnail. This is common amongst other photo forums as well. Its one reason many saturated and colorful images are viewed so greatly. I was just about to write what Aaron said. Next week take a standard postcard-like picture of the Golden Gate bridge or some other place like that. Then take an interesting picture of Leah Culver or some other web20/blogger female personality like that. Promote the bridge one like you promoted Hugh’s and then see how the results turn out. The image of my four-sided cube desktop (and all of my open apps) floating over the LVCC (and Hugh’s head) is pretty cool. Thanks for capturing the moment. I must admit, the first thing that comes to mind is of a sexual nature… THINK ABOUT IT! Yet it is not overtly obvious, therefore people didn’t feel dirty by going to see what you were talking about! I’m willing to bet the Sexual innuendo had more to do with the initial surge than anything! I must also mention, the photo is VERY COOL, so I wasn’t left disappointed! just reading this, and then seeing the photos at the end for the first time, I’ll throw this out there. The second photo (the popular one) is actually interesting. There are times for fish eyes and times for a more standard focal length. Even without the back story I find the gapingvoid a more compelling picture. Not only does it give the feeling of expanse to have Hugh close to a point of power (read: rule of thirds) it makes the picture more visually interesting. I personally say the gapingvoid picture required more photographic technique. Thanks to your post, I thrilled to learn its not just pilots far from their favorite female company that are clicking on the chicks. Well, the first photo is sort of generic– the same pov that any tourist in Las Vegas might have. No emotion, attitude or message. Null. The other photo is spectacular. Vast. Cinematic. The kind of shot that students would drool over back when I was in film school. And, it’s an interesting statement about the person in the picture. Proof that when we say “content is king” we don’t just mean any content. Robert – Interesting story of two pictures, thanks for sharing. On a side note, if you put some processing time into that second picture of Hugh, it could go from good to amazing. Thomas Hawk’s photographic eye and understanding of composition is far superior. Unless you’re talking about complete photoshop manipulation, if you don’t have a decent composition and interesting subject matter to start with, you’re not going to yield anything worth looking at. If you post your tweets when San Francisco sleeps http://bit.ly/3YbYx3 , you get more hits. We experimented it several times. I finally got a picture of @gapingvoid in a gaping void! http://www.flickr.com/photos/scobleizer/2894627944/sizes/l/ Awesome! When the famous bloggers are off to sleep, then you have more chance to be heard. Thanks for the links to Hugh, I think I may order some cards for my blog. Also, good points on Flickr. It’s amazing how many results someone can get just by tagging your photo as HDR. A few tweaks can make a huge difference. Basically the first one is generic and second one is lot more interesting. I’ve got to question if that picture was more popular just because it’s a better picture content wise. In reality, while you may appreciate the camera technique and effort in the other picture… it’s only you and a small audience who get/appreciate that. For some reason creative folks find this hard to believe. In tech programmers learn this very early on… nobody gives a cr@p what your algorithm looks like, or how eloquent your code is.. they care about the product. For content, producers tend to feel that the production is as important if not more important than the end product. I’m not sure why that is though. Awesome photos. The one on the bottom is truly stunning. Great info for all. I, of course, will need to read it a few more times before it sinks in. Heck, the whole thing was worth a read just to see you type “retweeted” in a context other than war strategy. I think you’re missing some important points. The “gaping void” photo is actually a much better image (in composition, not quality). It has the rhythm of the repeating columns and an eye-catching subject. The Bellagio picture, on the other hand, has no subject: what’s it a picture of? Ok, so there’s this hotel in Vegas—how many times have we seen that before. Even a person unfamiliar with gapingvoid.com could be attracted to that picture instead of the Bellagio one. Your promotion definitely helped, but IMHO its the image quality and composition that caused people to favorite it. And, sorry, but the carefully thought-out, expensively-equipped, scrupulously-planned Bellagio picture…just doesn’t cut it. Oh, the lighting and contrast make for a much more interesting palette, I’ll grant you. But what exactly does the fisheye view contribute beyond “HEY, I’M A FISHEYE!”? As for the composition, folks are sort of scattered about randomly, the Bellagio is neither centered nor interestingly off-center, the light fixture at upper left intrudes; only the exposure/tonal range (which *are* excellent, BTW), your commentary, and the fisheye perspective reveal that this wasn’t a happenstance snapshot. Whereas t’other…you’ve got immediate graphic interest from the seemingly infinite recession of pillars, a message from the single person dwarfed in immensity, the photo gets the viewer wondering about where it was taken…nice one! Agreeing with owen that this has to do with the thumbnail. In the first photo, you see all there is to see right off the bat. In the second, you want to see more detail, so you click. I’m drawn to the person – I wanted to see his expression and body language, so I clicked. Next time use the same photo with a slightly different title and apply the two different marketing strategies, this would make for a better side by side comparison absent outliers like search, related links, etc. But i’d have to agree with the masses, the second photo captures the attention for several more seconds than the Bellagio one, perhaps if you captured the water show it would have made a bigger splash. of course the real conversation should about the specifics of what we see. 1. On th 1st photo we see people who are looking at a golden hotel, we see water. This could be any tourist-town. It seems unclear why these folks are standing there and why it should be of interest to us. Like in commercial photography it projects beauty to please. It’s a -why do I exist?- photo. These are the kind you get on a DVD or buy at a photo stock website. The second photo is the photo we all make when we are around big things. Does it matters what kind of big object it is? No, it just wants us to say WOW and in this it succeeds. Do we care who is on the photo? Is it a better photo because x is in it? No, it doesn’t change the quality of the photo itself. For people who do not know Hugh Macleod (99,99% of all people on earth) this really doesn’t matter. In a strange way these photos are a bit the same. 2. They both want something. b. the 2nd photo wants to amaze me like a little boy who sees an airoplane for the first time. These photos are in need. 3. They feels the same. Like some kind of distance. So if you aggregate these photos like you did Robert, their importance will not alter unless you consider dominance in quantity a quality in itself. Like in money 😉 But! ‘Of little value is everything that has a price’ Friedrich Nietzsche wrote and of course, talking about photography this is true. Online, photos are free but what they refer to can be meaningful, priceless. The photo of Hugh is also the better photo, artistically. And more interesting. Expensive photo equipment and high-end lenses may offer more opportunities for great picture taking (faster, sharper, longer, wider), but they don’t automatically translate into better pictures. Never have, never will.